Red Crossbill in Fairplay Colorado @ 11,000 feet. Very tame. He was sitting on this feeder (female on opposite side) and neither budged when I got up to within 3 inches of them. Looked down at at at a friend's finger for a second but then went on munching. Very focused on the seed. Didn't fly off until his foot was actually touched. Jerkiness of movie is due to image stabilization of hand held camera (Canon SX50). 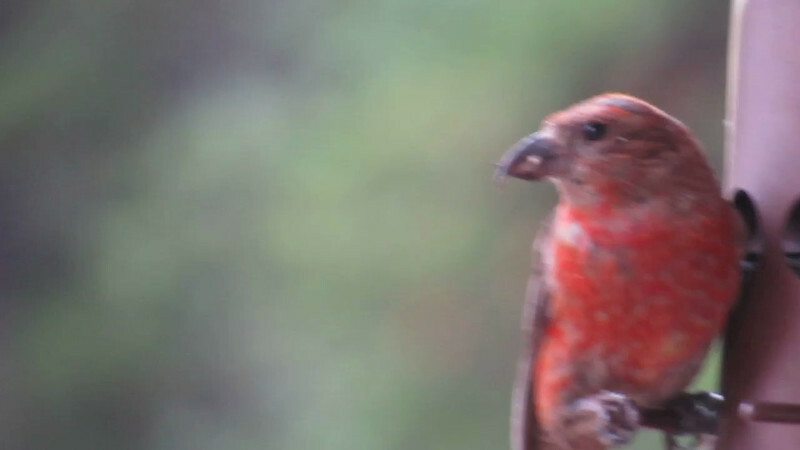 Red Crossbill in Fairplay Colorado @ 11,000 feet. Very tame. He was sitting on this feeder (female on opposite side) and neither budged when I got up to within 3 inches of them. Looked down at at at a friend's finger for a second but then went on munching. Very focused on the seed. Didn't fly off until his foot was actually touched. Jerkiness of movie is due to image stabilization of hand held camera (Canon SX50).